Well begun is half done. Eat a healthy, balanced diet. Cut out all starchy foods like white bread, pasta, potatoes to reduce calorie intake. Look out for a tip on fruits tomorrow. Today is Day 2 of your program. Avoid fruits like bananas, chickoos, grapes & mangoes. Have the whole fruit instead of the juice. Tip on healthy snacking tomorrow. We offers Holistic Therapy for permanent cure of arthritis, Spondylosis, disc disease, prolapsed disc, sciatica, vertigo, tinnitus, hearing deficiency, dementia, ataxia, Parkinson's or Alzheimer's disease etc. The programme aims at treating the root causes of the problem, not just the symptoms reported by the patient. A thorough physical examination and diagnosis helps identify the underlying cause. In-depth counselling sessions involving the patient and his/her spouse also facilitate this process. The mind influences our body in each and every aspect through the psycho-neuro endocrine axis. Healthy people are happy people and further happy people are healthier people. In the Holistic Treatment Services the Holistic Principle we describe the difference between Faulty Diet & Faulty Living and Excessive Stress & Pollution. Also we describe the concept of Holisting Management. Holistic treatment is a form of healing that considers the whole person - body, mind, spirit, and emotions - in the quest for optimal health and wellness. According to the holistic medicine philosophy, one can achieve optimal health - the primary goal of holistic treatment practice - by gaining proper balance in life. Vega test is a functional diagnostic method which diagnose all the functional disorder by using single acupuncture point. Holistic healing means taking an holistic approach when seeking treatment for imbalances and choosing to live a more balanced lifestyle. Holistic Healing involves addressing physical, psychological/emotional, and spiritual issues in order to promote healing and transformation. 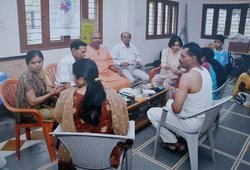 - A holistic research based health home in tune with traditional Indian holistic health care by Yoga Therapy, Ayurveda, Naturopathy and Modern Medicine for the treatment of life style related ailments. - Prevention and treatment of diseases. - Promotion of Positive Health. What primarily distinguishes holistic healing apart from alternative medicine, complementary medicine, and integrative medicine is that physical health is not necessarily the main focus. Holistic healing addresses all parts of the individual, not just the physical aspect of a person where manifested illnesses are most apparent. Till date, we cannot rule out the importance of media buying. Our greatest strength as a media buyer is the ability to create a media plan that best combines the power of traditional broadcast advertising with today’s emerging offline and online opportunities. Dentistry in India has come a long way and now India is a leading medical service provider for tourist coming to asian contries for their treatment and no doubt India is providing great destinations too. In case you are looking for dental treatment in Delhi, Dr. Asheesh Gupta is there to assist you.